If you are like us and need to know every new piece of news that surfaces surrounding the iPad, you will be pleased to learn that Apple has started an iPad news mailing list. 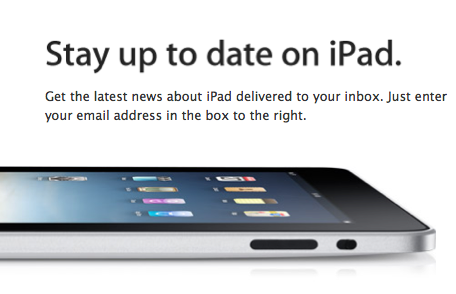 You can sign up for the mailing list and get up to the minute, breaking news from Apple surrounding everything iPad. However, you can always just stay posted to BlogsDNA as we will always be keeping you posted on anything they may unravel in the iPad world. Next Entry: Is Torchlight Coming to Consoles?